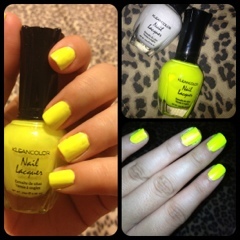 I love wearing neons on my toes but decided to try a neon mani- after seeing Kleancolor Funky Yellow while browsing for some summer clothes at a clothing store in Long Beach, I spotted this beaute and am so happy I did! I had gel nails applied last weekend (huge mistake! I hate that it's last so little on my nails), and I peeled them off! (Bad:( I know!) This color would probably look better on my nails when they're in better shape but as SoCal is already heading in the 90's I was very eager to try it out! I used a white base coat to get the brightness to show up- without it I think I'd have to use 4 coats. Here's a quick picture collage- as I mentioned it doesn't look perfect but my nails are in a bad state - true this neon will add attention, but I don't care- it's that pretty! Kleancolor (L) aw yessie, I miss your country so bad !!! That yellow is gorgeous! Great pick! New follower, awesome blog! I love Pool Party too. I like the sound of Shocking Pink-will be picking that up. Thanks for visiting my blog!